Phase 4 teaches you how to create and display the health of the tank. slider component, and it looks like this. normally expect from a slider. to create the same interaction. to create the same effect. color of that radial health wheel over time. to orange, to red as you loose health. And you'll see that as we go through. Okay, so first a couple of things. We're going to setup Unity to work how we want. the handles just won't appear exactly as we're doing them. up at the top of the interface. so I'm going to create a new slider. then UI section and choose Slider. cover some basics to begin with. screen, what we call a screen space canvas. any brand new UI canvas. that's rendered over the entire screen. we're going to do one of those later on. But for this we just want to make it world space. and then effectively redesign it. and it looks like this by default. to be dragging the health. It would be cool but it's not very fair. We're going to totally change how this behaves. is to tweak the event system. input in to that, that you might need. you might want to have something that's clickable on the screen. but we do want the event system to stay in the game. a joypad to select stuff. and they're the same as inputs in the input manager. want them to conflict with our actual controls of the game. in to these UI on the end. but that's all we need to do just to set that up. So horizontal axis just put UI on the end of both of those. and to set the actual rendering modes. and you can use a whole bunch of different scales there. And then you have Reference Pixels Per Unit. down to 1 instead of 100. So we set those reference pixels all the way down to 1.
render mode to World Space. they stop being greyed out, you can edit those. fields and that's exactly what we want. So I'm just going to recap a couple of steps there. so they don't conflict with out input manager. scaled it all the way down to the size of the tank. we can mess around with. Now that we've changed that stuff nothing looks different. Okay, so that's fine, that makes sense. and the positions and the width and height. and make them different, but we're not going to do that. And the anchors, and we'll come on to the anchors in a bit. instead of a normal transform. grab Canvas, drop it on to the tank. We want that canvas to drive around with the tank. tank around it's going to move around with it. So it's kind of strange, we don't want that. UI is now right in the middle of where the tank is. This would be an easier way to see it. That's it's axis handle, right at 0.
so we just change the width and hight to be 3.5. Scaled it all the way down. because it was showing me it. press F to zoom in. so we don't really want that. 90 in the X axis only. Okay, so just a recap of those values. and the rotation to (90, 0, 0). with it so I'm just going to show you that. is a child object and is going to move around with our tank. show you more easily where these bounds are. when we make the aiming slider later in the day. save our scene to update it. the slider is not where we want it to be. but it's a bit weird, so we don't want that. expand the canvas, the slider and everything. we need to do some housekeeping. as I said, that would be totally unfair. So we're going to get rid of the Handle Slide Area. command backspace to delete it. To make it non-intractable we'll have to deal with something else in a bit. the Background, Fill Area and the Fill. to select all of those game objects. So the the first one, shift, click on the last one. a certain position that's all the same. 3.5 square and it's following the tank around. So we're going to tell these to do the same thing. options for how you can layout your UI. they will be stretched over that 3.5 unit canvas. So that's exactly what we want, the latter there. the position at the same time for these things. that when I tap alt now all of these options are changing. right option is the one you want. You should see that you now have a grey square. stretched out of proportion from what it expects to be. We expanded the canvas with alt. Left clicking it's arrow expands all child objects. do that on the actual slider component. at all, uncheck that box. as you drag it we don't want that either. So we're going to set that to None instead of Tint. we don't need, it's going to hide them. And then this is going to be to demonstrate our health. and our max value to 100.
we're going to drag that up to 100. We want it to start with 100 health. So you'll see that currently it's doing this. So as I drag it you can see the slider's still working. And I've dragged that all the way to 100.
because there is none, so we set Transition to None. are both set to 100.
when you hold down the fire button. They're both using the slider component. we want to make sure things are nice and neat. our slider, that doesn't look good at all. that slider component itself, which handles the values. which handle a background and a foreground. tube that's being filled up as you drag your slider around. and currently it's got this default background source image. see there's something called HealthWheel. but it's just a circle with a gap in the middle of it. foreground is on top of it, so it's obscuring it. here in Source Image and it's at the bottom. change the alpha down a little bit. a kind of tint for this thing. or how opaque it is. you know, just a nice additional effect. So I'm going to drag the alpha slider down. it defines whether it's semi transparent. So if you set the alpha to a value of 80, 80. You'll be able to see through that really nicely. and we've made sure it's semi-transparent. Okay, so then we need to do a similar thing for the fills. So the fill is your foreground. is from top to bottom. basically the reverse of Photoshop. So in Photoshop you have a layers panel. at the back and the top of the list of layers is on top. where child objects are rendered in front . in front of the background. and again we want to choose the Health Wheel. which is one of our assets. right now because we don't have a script setting that up. going to handle the colouring, as I mentioned. clockwise fill up radially around the side. we want it to fill around, okay? is what we call Simple. We're going to set this to Filled. And then we need to change the Fill Origin to Left. around 90 degrees from which it starts emerging. the bottom of the tank and it looked quite nice. Again, it's not going to make a huge difference to the gameplay. like anticlockwise made sense for when you're losing health. But, you know, feel free to change that to taste. just to change the alpha on the Health Wheel. colouring so it's going to go from green to red for us. So a quick recap of those steps. so you'll be able to see through it. which is just a particular position on that clock. around backwards as you lose health. is a brief script called UIDirectionControl. we're going to drag and drop this on to the HealthSlider. drop it on to HealthSlider. it's a component underneath the slider component. what it looks like, it's just a couple of lines of code. the same rotation that it was at the start. So finding the local rotation of the canvas. so this is just setting it every frame. It's literally all that script does. So make sure you've saved your scene, as always. it when we last updated the prefab are in blue. These new child objects have their names in grey. of the components that things aren't the same as the prefab. in any of the game objects. So our tank is now up to date. the game manager spawning more than one of them. But we need to do some more things. make a sound when it's destroyed, right? for the explosion part itself. And then we're going to handle the actual behaviour manually. work with it very briefly. to the hierarchy, you'll see is a particle effect. drop it in, it should look something like that. play it back and play a sound. so that's what we're going to add first. 'Sou' is a quick way to get to audio source. so the circle select button there. And we're going to choose TankExplosion. whenever a tank gets blown up just move it and play it. playing so we uncheck Play On Awake. it doesn't play on awake. to regular I should say. And that's all we need to do with that TankExplosion. what it does and also add some functionality to it. we can then delete it out of the scene. on to our Tank game object. The last component I've got there now is TankHealth. So TankMovement is above it, it's the last one we worked on. 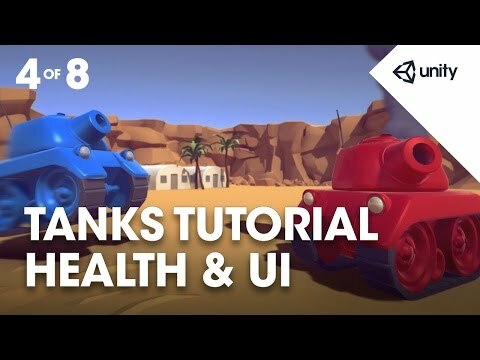 And now we've got TankHealth. is like before, we've got some portion of the script commented out. Get rid of those bits because we want to use that bit of code. So it should show up in syntax highlight colours. Okay, let's have a quick look at the public variables. The first one is the starting health. I'm going to start with 100, it makes perfect sense. value so that it's less or more. So it's just handling the values. the slider handles the values. the image component of the Fill game object. for full health and red for 0 health made sense. runtime and use it then. that's on the explosion prefab. the particle system as well. that we can use when we need to. So notice James is using the word Instantiate. and you'll see that very shortly in the Awake function. we've currently got, so we have that. boolean variable for whether you are dead or not. what's going on for the rest of the game. go over it a couple of times to make sure. What we're doing is we've got our explosion particles. particle system component of an instantiated prefab. to get that particle system reference that we need. So basically we have a particle system variable. a couple of things all in one line basically. that's also on that game object. to get the audio source component. So that's going to make it inactive in the hierarchy. the game than play them whenever you need them. Stop them, play them, stop them, play them. move that game object from the hierarchy. and make your game less performant basically. and that's exactly what we're doing with the explosion. for when we need them. them as the player uses them. after today and I'll explain it to you. keep them in and then spawn them whenever you need them. we kill them and bring them back to life again? first gets turned back on again. we want to reset it's health to the StartingHealth. to make sure that it looks healthy as well. refresh that we do on the OnEnable. we want the shells to do the damage. so that's the amount of damage that it is going to take. by reducing it by amount. So just a quick note for those of you not confident coders. and then parse in whatever number you want there. can be a number of different things. will define how much we want to subtract. If it's super close it's going to create a lot of blast damage. blast radius is then quite a small amount. So it's going to be a varying amount of damage we're taking away. and then we subtract that from the CurrentHealth. SetHealthUI function that we'll setup. they're not going to know. in TakeDamage is check whether or not we're dead. and we're not already dead, so not Dead. Then we can call the function OnDeath. so we're run out of health. & means add a second condition for the if statement. And the ! there is just means not. SetHealthUI that we've talked about. and we want to set the colour of the slider. of the slider based on the current health. in order to change it's colour. and what we're doing to do here is use a Lerp function. how much of each colour we're using. show when we are at 0.
when our third variable is 1.
what percentage of health we have. we divide the current health by the starting health. So if you've got full health, 100. Then your starting health is 100. 100 divided by 100 is going to be 1.
so you're going to use the ZeroHealthColor. so it's going to be halfway between those two colors. and then we reset the color to make sure it looks appropriate. we're not going to call it more than once. that we're only going to call it once by setting Dead to true. As soon as we call the function. transform.position, that's the tank's position. move them there and then. because remember we turned them off at the start of the game. So that's turning the game object back on. so Dead gets set to true. the correct position and turn it on. we play the audio and we turn the tank off. and return to the editor. So just a quick reminder of what we've just done there. We've setup our tank damage. when the tank dies and bring in the effects as well. and also save your scene. be in Window - Console. and as you see we need to assign some references. dropping that on to Fill Image. is in the Prefabs folder. drop it on to the Explosion prefab. If you then save your scene. this tank is up to date prefab-wise. hit the Apply button at the top of the inspector. Hit it as many times as you like just to be sure. And then you can play your game. the tank and we'll do that right after lunch. that the tank is driving around and we've got our health wheel there. in the project and put that on to that variable. And then we've applied, we need to update our tank. to spawn at the start of the game. pat yourself on the back, it's the end of phase 4.
public float m_StartingHealth = 100f;               // The amount of health each tank starts with. public Slider m_Slider;                             // The slider to represent how much health the tank currently has. public Image m_FillImage;                           // The image component of the slider. public Color m_FullHealthColor = Color.green;       // The color the health bar will be when on full health. public Color m_ZeroHealthColor = Color.red;         // The color the health bar will be when on no health. public GameObject m_ExplosionPrefab;                // A prefab that will be instantiated in Awake, then used whenever the tank dies. private AudioSource m_ExplosionAudio;               // The audio source to play when the tank explodes. private ParticleSystem m_ExplosionParticles;        // The particle system the will play when the tank is destroyed. private float m_CurrentHealth;                      // How much health the tank currently has. private bool m_Dead;                                // Has the tank been reduced beyond zero health yet? // Instantiate the explosion prefab and get a reference to the particle system on it. // Get a reference to the audio source on the instantiated prefab. // Disable the prefab so it can be activated when it's required. // When the tank is enabled, reset the tank's health and whether or not it's dead. // Update the health slider's value and color. // Reduce current health by the amount of damage done. // Change the UI elements appropriately. // If the current health is at or below zero and it has not yet been registered, call OnDeath. // Set the slider's value appropriately. // Interpolate the color of the bar between the choosen colours based on the current percentage of the starting health. // Set the flag so that this function is only called once. // Move the instantiated explosion prefab to the tank's position and turn it on. // Play the particle system of the tank exploding. // Play the tank explosion sound effect. // Turn the tank off. // elements such as the health bar face the correct direction. public bool m_UseRelativeRotation = true;       // Use relative rotation should be used for this gameobject? private Quaternion m_RelativeRotation;          // The local rotatation at the start of the scene.